The competition proposes the assimilation of 4 inner-city urban blocks into a unified entity, with the aim of improving the neighbourhood and the quality of life of the community. Our position is that the hegemony of contemporary socio-political conditions leads to the degradation of human beings through the unequal distribution of wealth, in favour of the few. What is required to address this issue is a new political approach that offers alternatives and opportunities for every citizen to provide for their own survival. Urban design cannot separate itself from this enabling obligation; indeed it forms the very breeding ground for such changes. The architecture prescribed by static models can no longer meet the demands of these new conditions. It becomes necessary to seek a new architectural discourse that stems from human interaction; proposing dynamic spatial systems for urban development. We believe in the “cascading” of the market place from the financial system back to the streets, a system of exchanging goods produced in every cell of the city via digital and other networks. 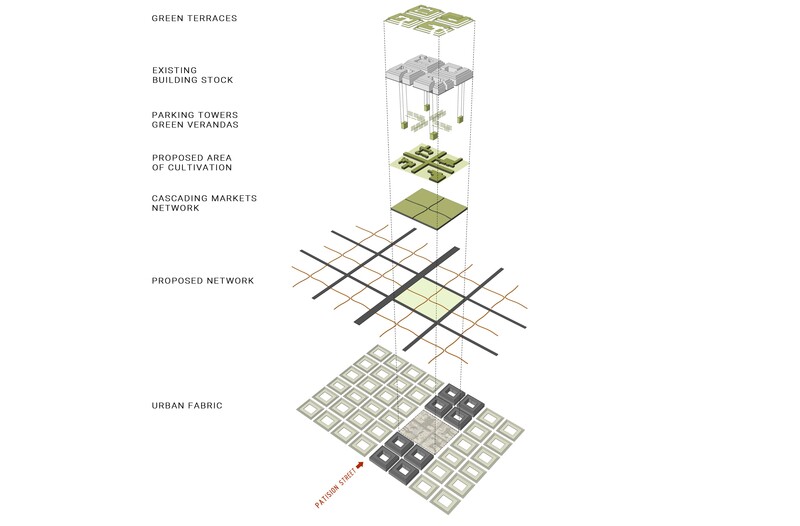 The new urban block has a dual footing: a city of planned interventions coupled with the aspirations of its residents. As a result, all available space is utilised for the production of basic goods, thereby integrating the provision of accommodation and subsistence. 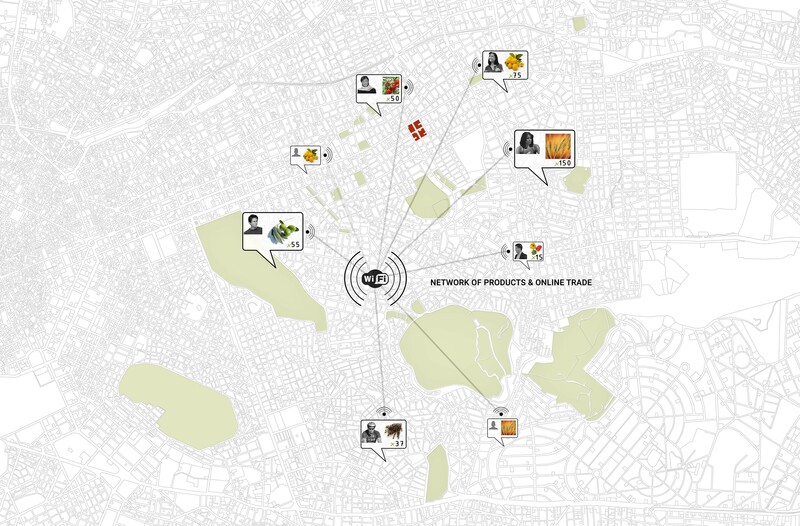 A new, dynamic system of cascading networks provides the driver, the basis, and the setting for a new urban market place for the exchange of goods, ideas and civilizations. The proposal does not take an ornamental approach to the city; rather it supports the input of its citizens into production reconciled with occupation, in this way helping to project the topical character of the place as well as its relationship with the city at large through use of the internet. The ancient Greek agora returns to 21st Century Athens in a contemporary interpretation.